Fearsome Foe Competition - Win rare unique prizes! 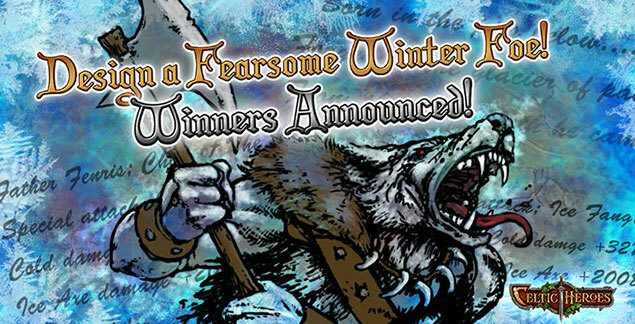 Re: Fearsome Foe Competition - Win rare unique prizes! Abomination of Jolnir--200 6* Idea for 2015 Yule Boss. The "2015 Samhain Boss" is filled with rage that he is perishing. His evilness decimated the land for as long as he could but it still wasn't enough for him. The souls he had captured simply didn't fulfill his desire to rule the land. So as he was falling, he opened the gates to the past and summoned energy from the previous evils that inhabited Dal Riata. With this energy, combined with his, and incorporating the energies of the souls that he had taken during his reign...he combined them all, and infused them all into a fiery magical gem that he then threw somewhere in Lir's Reach. Or so he had thought. Unfortunately for him, since he had given all of his strength and existence to this precious stone, it did not travel very far. So the next day, a Skullcrusher Tracker was out doing his daily tracking of adventurers, when he happened upon a red glowing rock. With the new fallen snow, the Tracker was cold, and could feel the heat given off by the stone. So he got closer to examine it. As he walked up he became engrossed by its aura, and couldn't help but pick the stone up. As his fingertips wrapped around it, and he lift it from the ground he knew at that moment he had made a mistake...but it was too late. Suddenly, his whole body began to shake and Lir's Reach seemed to go pure white for our tracker. Then it began, the rock and this tracker became one...but it didn't stop there. As his soul and this gem infused, part of Lir's Reach seemed to implode upon him. Sucking up so much snow and ice, along with the souls of some of the Skullcrushers around him, the three scryers (including their magic), and the three Jotuns to the south of him...they all seemed to become one. As this transformation happened, all of those sucked up died (allowing them to respawn and still be in the area). However the original Skullcrusher Tracker was still alive, just powered by the snow and ice he absorbed, the powers of the Jotuns, Scryers and Skullcrushers he combined with...but most importantly the powers that were bestowed in the gem that "the 2015 Samhain Boss" had left. Feeling the strength coursing through his veins, he decides he now answers to none, and the only thing that can subside his thirst for power is a mighty feast of those whom tempt him. He does not need to seek out adventurers...they will be ignorant enough to come to him. Powered by the heated stone, yet surrounded by the snow and ice this monster feeds on the souls of the adventurer's dumb enough to try to involve themselves in his yule tide power. This abomination spited Odin and declared itself the most powerful creature in existence. He carries with him a weapon that he created himself. It's a cat o' nine whip that he crafted from the bodies of those he devoured and tipped with magical icicles he crafted from his body. This whip causes immense pain and is tipped with magic that he himself can control. He has guarded himself by 6 souls from Lir's Reach. 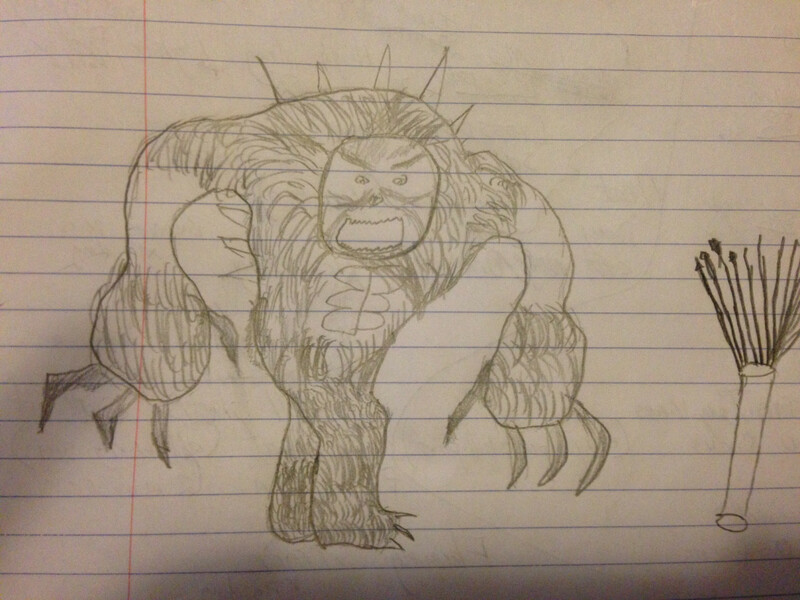 Three of them shall always be super powered skull crushers named Abominable Guardians with the ability to heal him. (190 2*s). Three of them alternate between the Abominable Guardians and the mightily powered Jotuns named Abominable Protectors (190 4*s) with the power to do an area swing causing frosty touch (Powerful frostbite) to all those within 6 meters of it. Abomination of Jolnir is truly the most horrific of foes. Do not test him, unless you are ready to be an addition to the menu for his mighty yuletide feast. The monster having absorbed so much ice uses the cold to heal itself. Incoming Ice Damage is absorbed. 50% of it restores energy points and 50% of it restores health points. The monster has low resists to crushing as that would shatter the ice and fire damage as that melts the ice. Abomination of Jolnir is still (granted deep down) a Skullcrusher Tracker, therefore poison damage is still effective. His resists to slashing and magic damage are standard for the 200 6* bosses in the past. Explanation - The idea here is to make sure people are testing the boss and using the best methods to kill this boss. Pierce damage resist is high as this is not meant to be an easy kill for rogues. Groups will want to be careful of their ice items and ensure they aren't using them...forcing them to find alternative ways to deal with this boss. His movement range and placement should be similar to what we saw in 2014 Samhain event. Due to a strong energy wall in addition to the stone wall at Warden's Circle he cannot actually reach the stones of the circle. Explanation - This prevents the boss from being reset via the stone circle, yet allows him to move around if the tank dies and kill everyone and everything. Abomination of Jolnir will not attack unless directly attacked. Attacking Abominable Guardians or Abominable Protectors will not cause Abomination of Jolnir to attack. Attacking Abominable Guardians or Abominable Protectors will not cause other Abominable Guardians or Abominable Protectors to attack. Immediately upon attacking Abomination of Jolnir, all Abominable Guardians and Abominable Protectors will attack. If Abomination of Jolnir is being attacked and an Abominable Guardian or Abominable Protector spawns, they will immediately attack. Abomination of Jolnir carries a cat o' nine tails (multi-tailed whip) weapon causing piercing damage to the specific adventurer that currently has his aggression. In addition to his melee damage, Abomination of Jolnir has 4 skills he can cast. Explanation - This will ensure more teamwork to kill the boss. It is likely one of the druids will need to have ward of ice to ensure that the tank stays alive. Explanation - Not much explanation needed here...it is the boss's way to try to kill the tank. Explanation - To ensure that the tank isn't too comfortable, and he take some damage over time. Explanation - This will ensure that groups are being careful when close to the boss. Mages, Rangers, and Druids are best to kill this boss, and they should be able to attack from outside of the range of this skill. Rogues will need to be protected or will need to stick to adds. 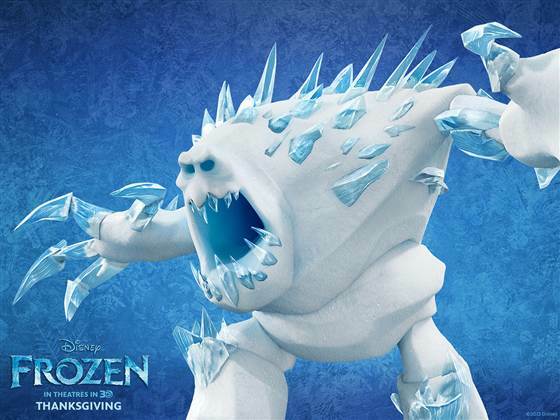 As I see Abomination of Jolnir he appears as a cross between the vicious abominable snowman and the ice monster that we saw in Disney's Frozen. I am NOT an artist, but I tried to give you as close as I could with the following sketch. 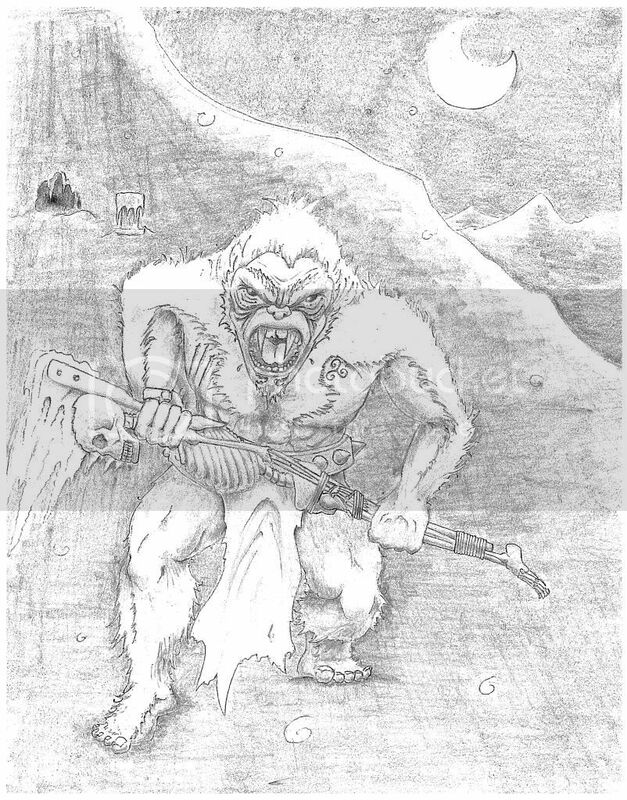 It is intended be the basic appearance of the abominable snowman we see below from Vegas Mike's deviant art page. With the frozen spikes and some of the appearance that we see from Disney's Frozen as pictured on today.com's website below. Upon destruction of Abomination of Jolnir the gem creates fantastic items meant to help even the strongest adventurer. This firey gem creates heated weapons, bracelets and rings that are very powerful. The godlys of which can compete with even the strongest of items reachable in the game. I have listed the Godly versions of each item below for your consideration/observation. Explanation--The godly versions of these weapons are intended to be competitive with Dragon Lord weapons even. The intent is to better equip the lucky players who receive godly's with weapons that they can also use to level towards the next game expansion. Explanation--The goldy versions of these bracelets are intended to be competitive with the best Mordris and Hrungnir Braclets. The intent is to better equip the lucky players who receive goldy's with weapons that they can also use to level towards the next game expansion. Flavor Text- A warm bracelet with a firey red hue. It is branded with the seal of Jolnir. Explanation--The goldy versions of these rings are intended to be competitive with the best Mordris and Hrungnir Braclets. The intent is to better equip the lucky players who receive goldy's with weapons that they can also use to level towards the next game expansion. Flavor Text- A warm ring with a firey red hue. It is branded with the seal of Jolnir. A level 190 2* add. He looks like a winterized larger sized version of Skull Crushers. He does drop xp commensurate of what a 190 2* should. His build should be fairly similar to that of the 190 2* spider adds that we saw in 2014's Samhain event, with the same ability to heal the boss. Abominable Guardians will not leave the heal range of Abomination of Jolnir. If Abomination of Jolnir is pulled its farthest from its original spawn point, then the Abominalbe Guardians will move to within range of healing their master. Three of the six adds would always be Guardians of Jolnir, while the other three would be Guardians of Jolnir 75% of the time. Explanation -- The idea is to kill the Abominable Guaridan so that they do not heal Abomination of Jolnir. A level 190 4* add. These would look like a cross between the Jotun Hammerer and a Jotun Frostsplitter. He does drop xp commensurate of what a 190 4* should. His build should be fairly similar to that of the 190 4* adds that we saw with the 2014 Beltane event, with the ability to cast frosty touch. Frosty Touch would be an AOE skill to affect everyone within 6 meters. It would be similar to a strong Frostbite doing severe ice damage over time to all those around. Three of the six adds would spawn as Abominable Protector 25% of the time. Explanation -- The idea is to have to kill the Abominable Protector so that they do not kill the dps. The fight begins with entering a randomized labyrinth in which all speed boosts are disabled. The team must make it through fighting mobs on the way. Mobs could include lost souls and death reapers. After making it through the labyrinth, you would fight a Minotaur. Skills could be something like power stomp as an AoE and maybe a charge where he attacks the player with the lowest aggro. Just sounds like a fun raid to me. Our currents raids aren't really raids, just boss fights. Seems we could use some change. An ancient scroll has been found in the castle's dusty archives, revealing the forgotten location of the famous artifact known as The Hero's Measure. The Hero's Measure is a magic mirror that is said to show any hero brave enough to look into it exactly what his or her true worth and destiny might be. Knowing the location, of course, is an obvious invitation! Once the hero enters through a secret passageway somewhere in the castle (represented by finally being able to walk through that door behind the fountain in the courtyard, of course), she (or he, of course, but I'm going to imagine our hero as a female for convenience) finds herself walking through a vast, empty underground space (alone, of course--only one player per instance). At the far end of a cavern full of gigantic stone pillars, the hero sees a huge, ancient, ornate mirror. The Hero's Measure! On approaching the mirror to view her destiny, the hero is attacked by a Dreamthief Fetch (fetch being a more Celtic term than doppelganger). The Dreamthief Fetch is exactly like the hero herself, wearing the same armor or fashion and using the same stats and equipment--so the hero must in effect defeat herself. If the hero manages to defeat the Dreamthief Fetch before approaching the mirror, a second one will spawn exactly like it, and after that, a third. The only way to escape the constant stream of identical foes is to break the mirror (It has a very high health stat but no need to fight back, since the Dreamthief Fetch is fighting for it), thereby refusing its judgment and portents and choosing to shape her own destiny. My illustration is an unedited screenshot of my hero and her exact double (played by one of my clanmates who I just happened to notice had my character's exact looks) standing in front of the fountain in the courtyard and the door through which the passage to the mirror might be found. Overlooking Farcrag Castle high in the mountains south of Lirs Reach, a great beast lives. Whispers of this monster began when Highshore villager’s cows began to go missing. Once Lord Maclir began to take these rumors as truth, he sent a legion of soldiers to capture the beast. Over a week later, only half of the men and women returned with the creature. Just taller then a man, with the strength of 100. They called it the Celtic Yeti. A cage of dragon scale and steel seemed to hold the Yeti well. only after weeks of no incidents, the master trainer decided to brand the Yeti, in honor of Lord Maclir. 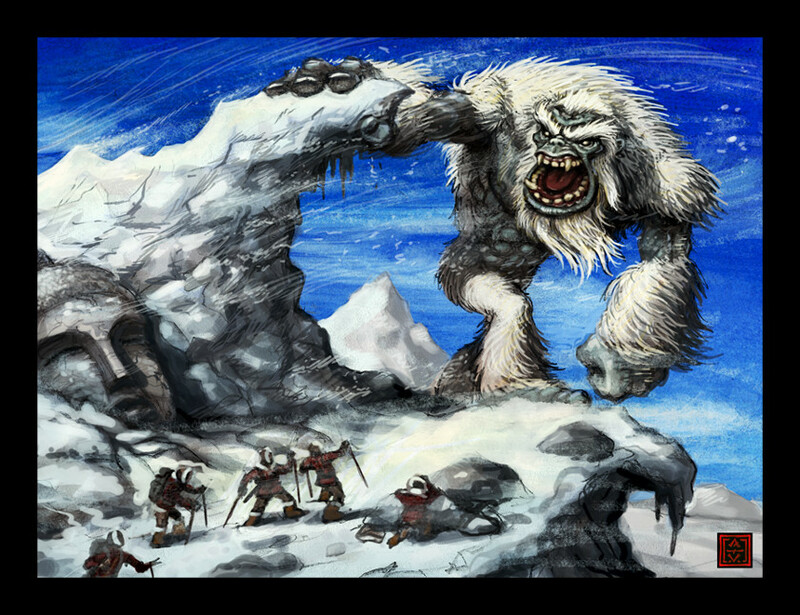 When the Celtic Yeti is enraged it attacks in a whirlwind motion, weapon extended, breaking off iclicles in its targets until none are left. It will then return the weapon to its ice pedestal, but untill the weapon freezes new deadly iclicles, it's no more then a piece of the steel cage that once held it and the master trainer that branded it. This creature will be a pictish warrior, but no ordinary pict. It will be a huge bloodthirsty thrilling berserker pict. But how does this scary creature look like? I will explain it to you. On his skin will be the scars, bloodstains and marks from his fallen enemies. It will be as big as someone with a growth charm and super growth potion combined. Shoes= A black leather shoe with spikes on the back of the shoe. weapon=The pict king will wear a fearsome great axe. This axe has been made of a rare steel of his homeland and will never break or shatter, how hard his hits may be. Berserker rush: He will charge to his target and nothing will stop him. This skill can’t be interrupted. He will be immune for movement slowing attacks like bolas, freeze, shield bash etc while this skill is active. Fearsome stance: Enemies attacking him with melee attacks will be stunned. And the pict king’s armour will be increased for a certain amount of time. Rampage: The attacks of the pict king will be significantly boosted. This will activate when he has less then 5% health. Bloodthirst: This is a skill that wil let the pict king leech health from his target with every hit that lands on his target. Ofcourse such a mighty creature like the pict king has many followers. Yet only his most thrustworthy compagnions may aid him against the heroes of Dal Riata. He will have two minions that will aid him in battle. One will be a druid-like creature. A berserker that will focus on healing his master. He will use mainly auto attacks and will heal his master once in a while. The other minion will be a rogue-like berserker. He will use fast high auto attacks and has a skill that will lower the targets defence. In my opinion OTM should decide the drops. If i would give some suggestions i am sure they would be way too overpowered. Heroes! You're certainly creative! The studio had a good time reading through all your entries. It's taken us a long time to choose the top entries but here they are. The Winner (winning Grand Yule Wings & Mauve Star Dust Top Hat): Frejlheir - their entry was emailed in and has been added to this post if you'd like to take a look. Their boss was called "Gofraid the Exiled"
Since ancient times, mankind has had fear of the unknown, about the phenomena that cannot be explained by any means. Fortunately, science has proven the nature of these phenomena, and for what science cannot explain yet, mankind has manifested it in the form of legends, myths, magic, etc. The latter has led to the creation of fantastic displays of art: Paintings, Sculptures, Literature, Theatre, and most recently Cinema and Videogames. With this said, mankind no longer fears these fantastic creatures coming from the previously mentioned media, and instead find them fascinating, entertaining; an escape from reality. And now we have reached what truly makes mankind fear: reality. Why does reality seem to be so frightening? Because we know what is real. War, hunger, diseases, nuclear disasters, … men. Even though us humans are social beings, we can’t yet fully understand other humans. We can’t predict what our neighbor will do, neither good nor evil actions, and neither if these actions will affect us (or not) directly or indirectly. There is uncertainty. Since most of us yearn for control over our lives up to a certain degree, uncertainty creates uneasiness, fear. I now state that the most fearsome foe of all is a man. But no ordinary man can be this fearsome. He has to be someone who can shake reality so, that everything we know may be jeopardized. Once we reach a certain state of comfort, we are reluctant to change. And what changes towards our reality can bring us fear? The answer may vary from each individual, but we all will ultimately share the same fear for something to change: Society. Thus, this man must be able to change Society as we know it. Who can possibly be so influential as to change society? Someone who not only can convince people to follow him; he who not only is strong or wise; he who has the right to do it. Gofraid the Exiled (making reference to Dal Riata ruler Gofraid mac Fergus or Godred MacFergus) and his legion. Gofraid MacLir was the legitimate heir to the throne of Dal Riata. Since a young age, he excelled in every study: arts, religion, politics, swordplay, etc. He quickly grew into a fine man. Despite his incredible display of abilities, there was something ominous surrounding him, as well as a gaze that would make uneasy anyone facing him. Misfortune also had grudged him since birth. It was foretold by some druids, followers of the goddess Epona, that the future regarding Gofraid was unsure and surrounded by darkness. Regardless of the prophecy, the clan gave Gofraid the chance to prove them wrong. And the prophecy was then proved right. Gofraid showed an increasing instability towards his mind, until he was found to be taking part in dark rituals and making offerings to Crom. He was then judged and found guilty of cruel sacrifices to Crom. But as he was a part of the clan, he was to be exiled out of the realm along with some of his loyal attendants and followers. This was the last of the mistakes the clan made. 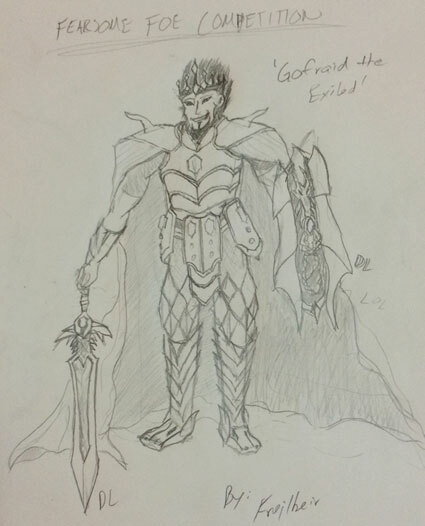 Due to his exile, Gofraid wandered the Otherworld, surviving and slowly gaining further strength and skills. His wandering then led him to the other exiled ones, the Blackstone, powerful Crom followers. With their help, he learned an even darker art: Necromancy. Combined necromancy with Gofraid’s royal blood, he was able to summon back from death something that will help him take back the realm. He was able to summon those heroes who had lost their lives in epic battles; those heroes whose skills and strength had no equal; those heroes who even in death yearn for a last chance to battle; and those who want to test the young rising heroes of the present. He was able to summon Highlanders. Along with his trusted generals and chiefs that had followed him even in exile, and his new necromancy power, Gofraid is now ready to take revenge on those who had denied him from what was rightfully his. High Crush and Slash RES, Mid Pierce RES. Can be of any class and gender. Can be any class and gender. If the boss resets, the Highlanders vanish, as well if the boss dies. May stack up to 10 if they have not been defeated and the Boss manages to cast the summoning skill. For the Highlanders’ names, my proposal is to name them as retired players as if doing an ‘In memoriam’ tribute. They can also have generic names such as the new option of randomized names. Neither Exiled Guardsmen, Blackstone Shamans nor Highlanders yield XP, gold or drops. Gofraid the Exiled will appear to have the Golden Growth Charm equipped. Though the drawings lack color, the armor set is supposedly dyed black. The dragonlord weapon and offhand will be dyed in black too. Generals will appear to have the Golden Growth Charm equipped. Chiefs will appear to have the Silver Growth Charm equipped. Male guardsmen will have the fashion of the MacLirs Clan’s Spear Guards dyed in Black. Female guardsmen will have the fashion of the MacLirs Clan’s Bow women dyed in Black. Blackstones will not be changed, but will appear to have the Silver Growth Charm Equipped. Since they have been summoned using Necromancy, Highlanders’ bodies should have some degree of decay, that’s why my idea for their skin is to have the same skin appearance as Tor Caith Fairie Charms. If this can’t be possible, gray skin color. Any class and gender with their Dauntless Tier set dyed in Black. Warrior: Ancient Falchion and Mighty Crown Shield of Spirits both dyed in Black. Rogue: Ancient Langsax and Golden Bodkin of Spirits dyed in Black. Druid: Ancient Bear Totem and Golden Focus of Rejuvenation dyed in Black. Mage: Ancient Scepter and Golden Focus of Rejuvenation dyed in Black. Warden set dyed in Black. Warrior: Diamond Longblade and Royal Shield of the Mountain both dyed in Black. Rogue: Diamond Dagger and Golden Dagger of Venom dyed in Black. Druid: Diamond Icon and Orb of Spirit dyed in Black. Mage: Diamond Wand and Master Grimoire dyed in Black. Warrior: Ancient Wyrmbone Sword and Shield of the Bastion both dyed in Black. Rogue: Ancient Wirmbone Dagger and Dagger of Bounty dyed in Black. Druid: Ancient Wyrmbone Totem and Idol of Sorcery dyed in Black. Mage: Ancient Wyrmbone Wand Focus of the Mystic dyed in Black. Warrior: Dragonlord Sword and Dragonlord Shield both dyed in Black. Rogue: Dragonlord Dagger and Dragonlord Rondel dyed in Black. Druid: Dragonlord Totem and Dragonlord Codex dyed in Black. Mage: Dragonlord Wand and Dragonlord Grimoire dyed in Black. Phrases have been given before to Celtic Heroes XP bosses from Samhain 2014 event. The phrases appear in orange color. The background plot was based on the play ‘Life is a dream’ by Pedro Calderon de la Barca. Generals and Chieftains’ names are based on Dal Riata’s rulers. 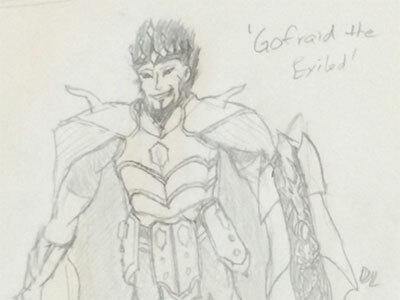 Gofraid’s personality and design was based on Fire Emblem: Awakening character King Gangrel. Gofraid’s chest armor was based on the Dragon Quest VII game King’s Armor. The black dyed fashion was based on ‘Saint Seiya - The Hades Saga’. Athena’s Gold Saints were revived as Hades’ Specters: Aries Shion, Pisces Aphrodite, and Cancer Death Mask. Highlanders’ rotting skin is based on Naruto Series’ Forbidden Technique Kuchiyose: Edo Tensei. Highlanders’ will to keep fighting was based on Norse Mythology. Einherjars were those fallen warriors who met their glorious death in battle. They are then recruited by the Valkyries and wait at the Valhalla eager to fight at the day of Ragnarok.